The French 75 has bcome something of a New Year’s Day tradition for B & me. Sadly, it is something of a leftover drink for us. As it requires sparkling wine, I just don’t seem to ever open up a bottle just to make this cocktail, which is a shame since it is such an enjoyable drink. The French 75 dates from the big war. It was a favorite amount the denizens of the officers club. It takes its name from the French 75-millimeter M1897 canon, a.k.a the French 75, which was the mainstay of the French field artillery during the first World War. Famously in Casablanca, German officers order French 75’s at Rick’s Café Americain shortly before the establishment was shut down on the startling discovery of gambling on the premises. Stir gin, lemon juice and simple syrup with ice in a tall glass. Top up with sparkling wine. 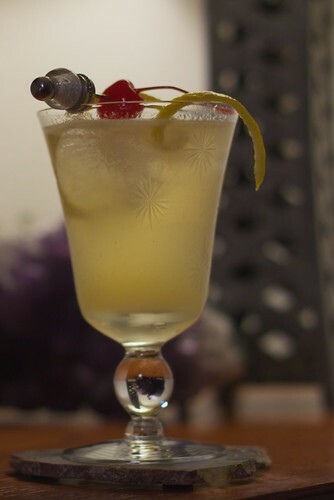 Garnish with a twist of lemon and a cherry as desired. We really should make this more of a deliberate drink. I think one of the next dinner parties we have, we’ll have to serve them. Recipe and history from Eric Felten’s How’s Your Drink? : Cocktails, Culture, and the Art of Drinking Well. I highly recommend getting a clamping champagne topper. They run around $6 and will keep the bottle bubbly for a month or so. Great for cocktail usage where you’re only using a few ounces here and there. Thanks for the sugguestion. We have one of those springy champagne stoppers. You’re right they do work well, though I don’t think the one we have would be good for a month. Certainly it’s good for a few days or a week, though. I was also thinking about getting half bots.